Cover design by Melissa Stevens at http://www.theillustratedauthor.net. 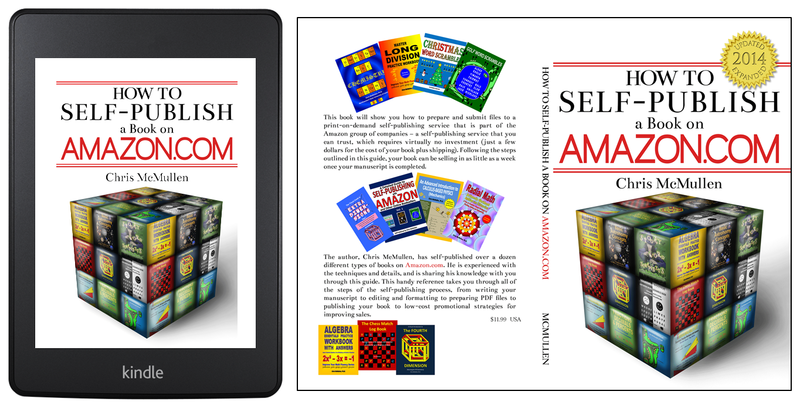 Is Kindle MatchBook Working for You? Authors who are eligible almost always check the box to enroll in the MatchBook program. Why not? Nothing really to lose, but you might generate a few extra sales. But many authors aren’t getting as much out of this valuable marketing tool as they could be. If the only thing you do with MatchBook is check that box to participate and select a MatchBook price, you probably won’t get much out of the program. Why not? Because most people aren’t going to see the offer, and many who do won’t fully realize how beneficial it can be. You can’t see the offer from the Kindle e-book’s product page (unless you’ve already bought the paperback edition). So if the customer was shopping for the Kindle edition, the customer will just buy the Kindle edition without even realizing that MatchBook was a possibility. It’s not very visible on the paperback product page. There’s a little note about it on the right-hand side a ways down, overlooked by most customers. You can only see the MatchBook offer on Kindle e-book’s product page in the following circumstances: (1) the book is participating in the MatchBook program (2) the customer has already bought the print edition from Amazon (3) the customer is presently logged in, using the same account used to purchase the print edition (4) the MatchBook offer is the lowest available price to the customer (e.g. if your book happens to be free or on sale for a price lower than the MatchBook price, then the MatchBook offer won’t be shown). Among those few customers who do see the MatchBook offer, many won’t realize on their own how they could really benefit from it. This doesn’t mean that Kindle MatchBook is of little importance and can only add on rare sales. Let me first back up and give an overview of what the Kindle MatchBook program is, then I’ll provide some concrete suggestions for how to take advantage of this promotional opportunity. Kindle MatchBook is a promotional tool available to authors who have both print and Kindle editions of the same book. The author or publisher can then choose to enroll the Kindle edition in the MatchBook program. A promotional price is set for the MatchBook offer. When a customer buys the print edition of the book from Amazon, that customer becomes eligible for the MatchBook offer. The customer can then buy the Kindle edition at a special price. Essentially, the MatchBook program provides an incentive to customers to buy both print and Kindle editions of the same book: Buy both editions and save. One way to inspire more MatchBook sales is to learn some effective techniques to sell more paperback books. The more paperback books you well, the greater the chances of customers discovering and taking advantage of the MatchBook offer. I sell 8 to 15 times as many paperback books as e-books, and every month some of my Kindle purchases are through MatchBook. Obviously, some types of books tend to sell better in paperback than others. Many kinds of nonfiction books, for example, tend to sell better in print; many fictional works sell much better as e-books. But even with books that tend to sell better as e-books, there are still many customers who prefer printed books to e-books. There is a market for print books. You just need to find ways to tap into this market. Or include just the link to the paperback. Yeah, it’s the higher price. Think about it. The customer is considering buying a $13.25 paperback. Then they see there is a Kindle edition for $3.99. Having just seen and considered a $13.25 paperback, your $3.99 e-book looks like great savings. Do a book signing. Gee, customers will need to buy some print editions in order to get their autographs. You make a higher royalty when you sell author copies. Customers who buy author copies aren’t eligible for MatchBook, but these paperback sales may help inspire more sales (see my point about how print sales help with marketing below). Get local bookstores to stock your book. Get the local library to keep a copy of your book. Again, these won’t be eligible for MatchBook, but can help inspire more paperback sales (even on Amazon, through the marketing effect of having more paperback books out there). Perhaps you can find a local or online book club that uses print books to use your book. There are many ways to use your creativity to help market your books; what you really need to do is get your brain churning and focus on where to find your target audience. With all the marketing you already do, just add a brief note at the end of it to the effect of, “Get the Kindle edition for 99 cents (or whatever it is) when you buy the paperback from Amazon first.” Or you can shorten it something like, “Kindle MatchBook price: 99 cents,” then describe briefly what the customer needs to know about MatchBook in a footnote or endnote. Even better, advertise an incentive for customers to buy both the paperback and Kindle edition together through MatchBook. Show customers how this can be handy. For example, you can buy the paperback edition as a gift and read the Kindle edition for yourself. That’s perfect for Christmas and birthdays. Advertise this during the holiday season: “Give a great gift and keep a copy for yourself.” Mention how MatchBook allows you to gift the paperback and keep a Kindle edition for yourself at a discounted price. MatchBook is a great Christmas marketing tool. When you interact with people in your target audience (something you should be doing as part of your marketing anyway), mention how they can take advantage of MatchBook and show them why this may be useful (i.e. mention the gift idea). MatchBook isn’t the magical tool that will do all the work for you and end your marketing woes all by itself. But MatchBook does have amazing potential as a marketing tool. You really don’t have to do additional marketing to take advantage of MatchBook. You just need to briefly mention the MatchBook potential in the marketing you already do. Some authors excel at making the most of the free marketing tools at their disposal. You could be one of those authors. What it really takes is the determination and motivation to succeed at it. It sounds a little ironic that reading on a Fire doesn’t bother your allergies. 🙂 (I like the sound of “reading on Fire.”) I love and appreciate your reblog strategy. Thank you. I know it’s been a while since you posted this, but I just found out about Kindle Matchbook and I was trying to find out just what you wrote in this article, so I wanted to thank you. Question: I am charged an almost $4.00 delivery fee for my Kindle book. Would Amazon charge me a delivery feel if I set the price of my Kindle Matchbook at $2.99? Thanks!